You don't have to be a fan of AMC's Mad Men to appreciate the amazing set design created by Amy Wells to look like the 1960's, or here 1963 to be exact. 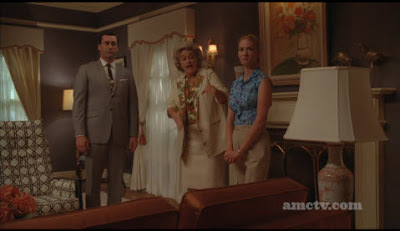 In last weeks episode Betty Draper redecorates her family room with the help of a decorator. 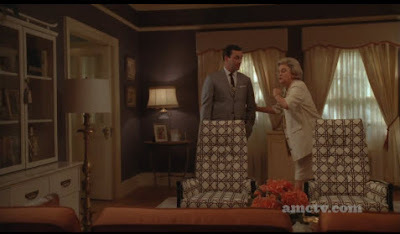 We first see the new room as the decorator points out the new design elements to Don Draper (her husband), to kind of gain approval of the new look. She goes through the room and lists off the new items: a modern Chinoiserie breakfront, a Dunbar Japanese influence sofa, silk duponi drapes, Murano vases, and a classic Drexel end table. All of these are classic, high end pieces of their time. The orange sofa is quite a change from what would have normally been in households of that time. Being an era of buying non-disposable items such as a neutral colored sofa that went with everything, the orange one we see here is moving ahead of their times. The set designer did an amazing job turning back time for this show and coming up with designs and pieces that are classic 1960's. When I first saw this episode I immediately saw influences from Dorthy Draper and Sister Parish. Maybe its because the decorator here resembles both ladies a little bit. To me this room has elements of both designers. Since its a clean room with not alot of clutter it looks as if Sister went through and "trayed" all the items that did not belong or that she didn't approve of. 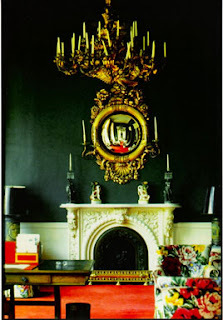 The use of color here is just like one of Parish or Drapers designs. The artwork over the fireplace looks classic Parish. 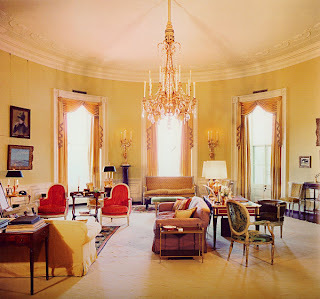 The use of luxurious materials such as the sofa and silk drapes are clearly Draper influenced. If you watched the episode the decorator states that the heart of the room is the fireplace and that everything revolves around that area- clearly something Draper has stated numerous times about her designs and how she felt of that area. The two cane fabric side chairs could be playing off of a Parish's classic design element which was to use quilts for upholstering. There are also things missing or conflicting with what each designer was known for: there are no large bold floral prints as Draper loved, lack of any bold pattern really. The room looks too boring for a Parish design, and she probably would have said that it lacked any imagination. The sofa has very modern lines for its time and does not look like the work of Draper since she loved using elaborate, over scaled elements. Maybe Don and Betty Drapers family room was done by neither designer. Since by 1963 Draper was past her high point and Sister Parish would not have designed a room so simple and plain. According to this article the set designer Amy Wells, uses influences from all different designers so in my opinion it channels both ladies famous designs. The room elements the designer listed off in this Mad Men episode are clearly classic designs as most of the names and items used are still around today. 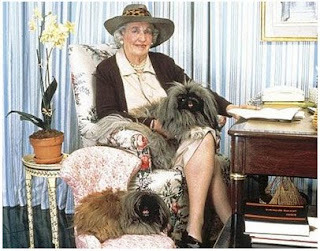 Even if they didn't design a room to be classic and just designed what they loved best, Sister Parish and Dorothy Draper are two icons that pioneered design elements that have stood the test of time. 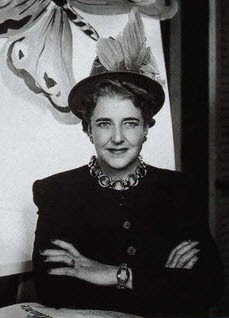 For more on Sister Parish check out Sister Parish Design and Dorothy Draper & Co, Inc. 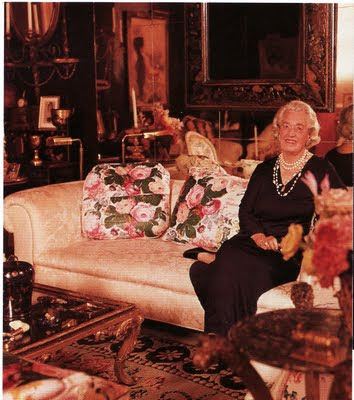 I saw no mention of what the designer said after Betty got her fainting sofa, ha! haha Marie that was classic- it was such an awful sofa I had to leave that part out. I love that the designer was like do NOT tell people I did this, I dont want my name on this! Fun post! I've never seen Mad Men but I've heard so much buzz about it! you've made me want to check it out now! i DIED over their new living room during sunday's episode! those chairs! omg. Great post! I need to see the show, and this episode!! 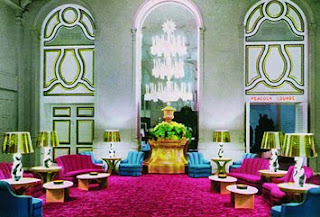 LOVE the last image of the Greenbrier Hotel, those colors!! Shockingly beautiful. 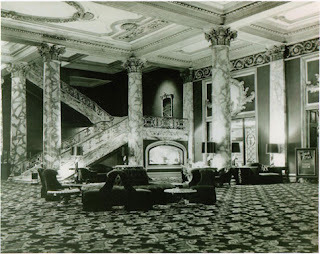 I stayed at the Mark Hopkins when the hubs and I were in SF. I wish it still looked like that! Very chic. LOVED that living room when I saw it Sunday!!! Did you see my Dorothy Draper tribute post last Friday?! I think my "spidey sense" picked up on the vibes somehow! I might be the only one not watching this! Too sucked into catching up on True Blood. Love Dorothy Draper though, so I'm thrilled to see her on here! awesome!! i just got some sister parish fabric in the mail!!! I love this post! I am so obsessed with Mad Men and loved Sunday's episode specifically because of the decorating scenes. Aren't the cane print chairs fabulous? clearly I need to get on the Mad Men bandwagon if not for the plot, for the apparel and the set design. Thank you for this!! so funny, was going to post that room today too. LOVE Mad Men. I like their new living room design. Great post, so interesting to read after watching the last espisode! Cool little history lesson, even though I don't watch the show.